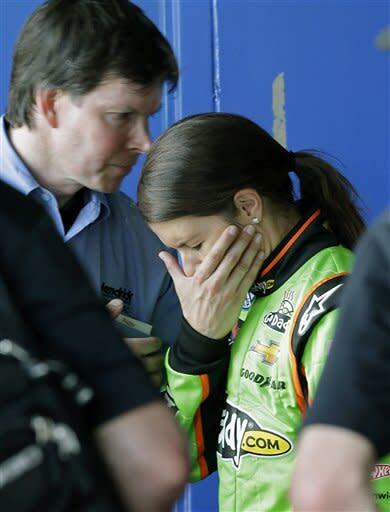 DAYTONA BEACH, Fla. – After an ignition failure ended Danica Patrick's Nationwide race early on Saturday, she was asked if she planned on enjoying a calm, quiet night in preparation for Sunday's Daytona 500. "Well, I'm probably going to be angry watching the [Nationwide] race rather than being in it for a while," she said. Danica wasn't pleased on Saturday after an excellent start to the Nationwide race blew up 30 laps into the 120-lap race when her car lost power going into Turn 3. "It just died," she said. Patrick made a mistake of inexperience when she chose to roll her car directly to the garage, rather than pit road where the issue could have potentially been fixed. In the end, it didn't matter. Danica was done. "A good lesson that if there was a potential fix at some point, you know you just always go down pit lane and get in your pit box and just do everything possible to fix it," Patrick said. Standing outside the car in the garage, she was visibly angry that her error potentially caused the day to end early. "I was pissed," she said. Regardless, Danica didn't see Saturday as a complete waste. She raced well early in the Drive4COPD 300 in the lower-level Nationwide race. She gained experience and understanding, she said, that might help her in the elite Daytona 500 on Sunday, which she begins as the top qualifier. "I was working with a lot of guys out there," she said. "Unfortunately it ended early, but there were a lot of [Sprint] Cup guys up there [and] hopefully I showed them my ability to work through traffic and my ability to get to the front, so hopefully that will help for tomorrow. "I am ready to help if I need to and that I am anxious to," she added. Saturday was the warm-up act. Sunday is primetime. She says she may be more frustrated after the race, but also more prepared to contend in the 500. "So it's not completely for naught," she said. "It was fun." At least while it lasted.